Ridureyu is back tonight a review of the latest in the ROTS line up. What's the scoop, Ridureyu? Revenge of the Sith is an interesting movie. It has managed to single-handedly polarize fans of the Star Wars movies like nothing else. Some people violently, virulently hate the movie and everything it stands for, and often use obscenities to insult anybody who likes them. Others love the movie with such a religious zeal that any complaints are met a light saber to the throat. I liked the movie. I really did - I liked it a lot. Sure, it's not as good as, say, Casablanca, but that's not how I judge movies. I happened to enjoy the prequels - of course, it helps that I've met people who talk like the characters in the Star Wars movies. There are plenty of couples who are awkward, stilted, and fundamentally stupid. There are tons of clumsy goofballs who talk like Jamaican stereotypes (most of them are white). The plot was actually what I enjoyed about them - nobody expected the Clone Wars to turn out the way that they did, with the Jedi technically helping the bad guys. But that's not really what Star Wars is about. Really, it's about the aliens. The background aliens, specifically. You know what I'm talking about, and it's not new to the series. From the moment that Luke and Obi-Wan walked into the Cantina and we saw a giant snail with a mug of beer (That's "Momaw Nadown" or "Hammerhead" to you), audiences around the world were hooked. Were they invented purely for marketing? Telling from the fact that we've been getting random alien action figures since the 1970s, I'd say yes. Does that cheapen the fact that they're there? No. If anything, the background aliens are one of the things that add most of the necessary atmosphere to these movies, and one of the things that I can say I really, really enjoy about Star Wars and that sets it well above other films. In fact, just look at how often the Cantina scene is blatantly and shamelessly ripped off for proof of my point. 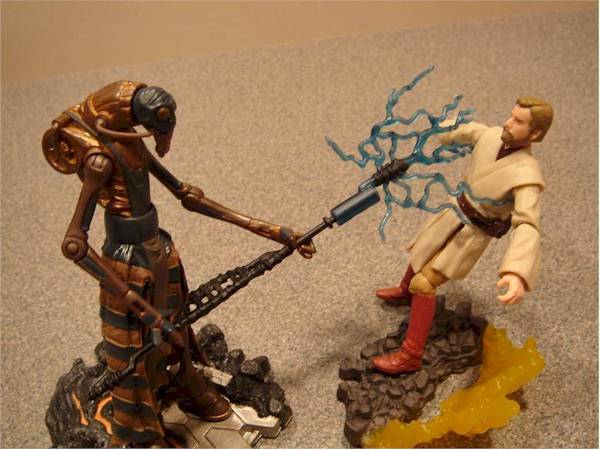 Revenge of the Sith had a ton of background aliens, and the toys have certainly supported this. 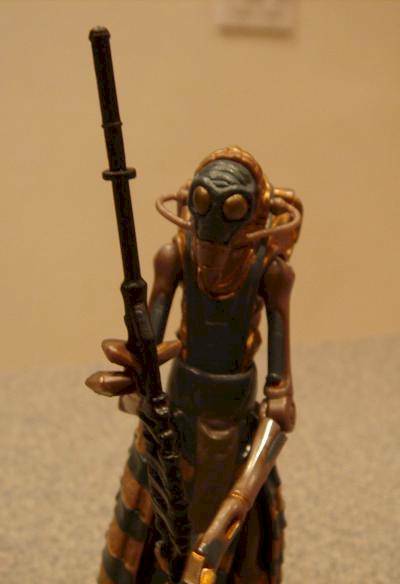 Some of them have sold like hotcakes (Ask Aak), and others are warming the pegs in droves (Neimoidian Warrior). Some of them don't actually appear to be in the movie at all (Utapauan Warrior). Near the end of the movie, when Anakin was on his quest to dismember the Separatist leaders on the fiery planet of Mustafar, there were two alien sentries standing in the background when he told R2 to "Wait by the ship." The aliens from planet Utapau were originally supposed to be the inhabitants of Mustafar, but after Lucasfilm decided to move the fanged grey-skin aliens to Utapau, they came up with two separate species for Mustafar. The southern Mustafarians are shorter, more muscular, and can be seen shoveling lava during the big light saber duel. 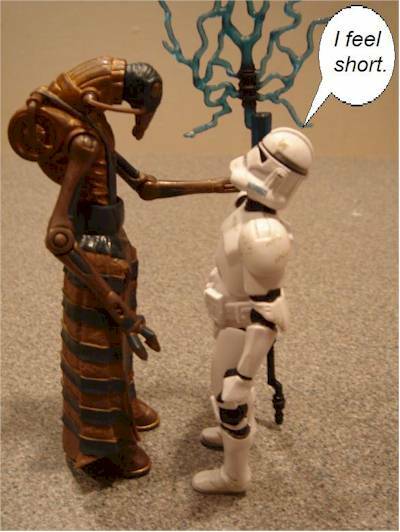 The northern Mustafarians are the taller, skinnier sentries depicted earlier in the movie. They also ride gigantic flea-like creatures (here's hoping for a future release! ), and the figure was originally called a "Flea Rider." This figure is #56 in the Revenge of the Sith line, making it the last regular figure before the "final twelve" revealed at SDCC this year. So, how does this figure measure up? Let's have a look! By now, we're all familiar with typical ROTS packaging. It looks nice, displays well, stores poorly, damages easily. But hey, it looks cool, and advertises the Mustafarian's "Spinning Energy Bolt." The Mustafarian himself stands sideways in the little plastic bubble, which I think is a first for this toy line - the figure's not facing you directly. There are no "hidden" accessories that are easy to throw out like a lot of the figures have in this line, which is a good thing. 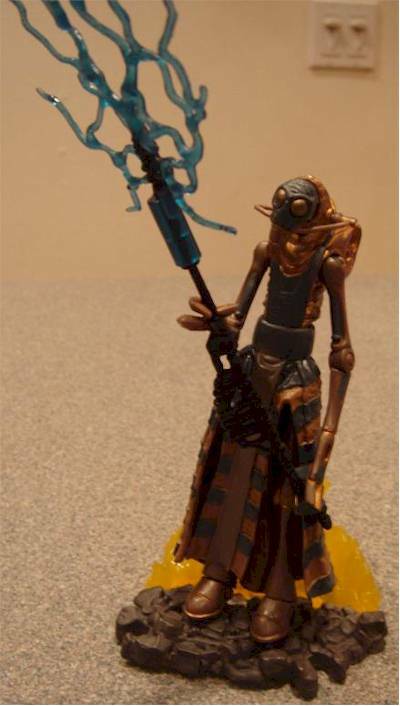 Of the crazy blink-and-you'll-miss-them background aliens that we've gotten recently, I have to say that the Mustafarian Sentry has the best sculpt. Unlike the incredibly-detailed alien senators, this is an alien for which there is no previous reference anywhere in the movies. It's tall, thin, and insect like. The Mustafarian has wide, bug like eyes, and a long, curled snout - slightly similar to that informant guy from the first movie, but not quite. The sentry wears a really complex suit, which is obviously there to keep it cooled off enough to survive being out in the open in volcano-world. There is a large cooling unit/air tank on its back, which looks like a high-powered air conditioner. It's wearing a big skirt around its waist, which the Visual Dictionary said was made from "Kubazian material." Fun trivia: The informant guy from the first movie was a Kubazian. Coincidence or conspiracy? The Mustafarian's skirt is rubber, (thankfully) not soft goods. 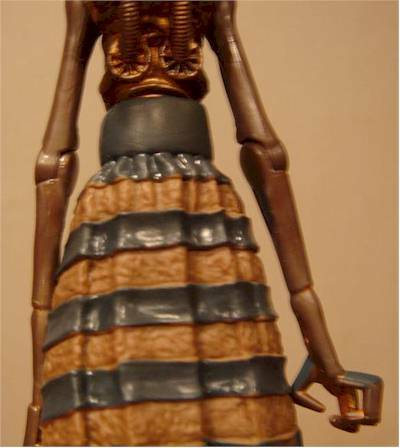 I know that soft goods have their place in action figures, but it would look really bad on this figure, and probably make it impossible to stand - as it is now, the skirt serves as a nice stabilizer for the tall, skinny toy. Its surface is nicely textured, and looks like cloth. 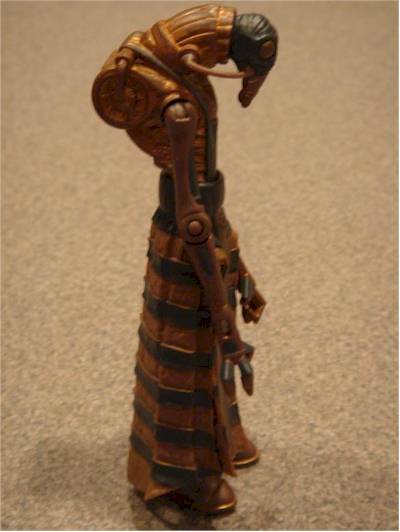 The Mustafarian's limbs are armored, and both its knee and elbow joints look mechanical - realistic joints in the armor. There are all sorts of other little details, too - the texture on its shirt looks more like wrinkled foil than cloth, for example, which is probably to help keep more of the heat out. There are gaps in its wrists which imply that the creature's physiology is really, really different from a human's. Even the inside of its ankle joints are detailed! Considering that you only see this alien in the shadows, and the world that it's from has a pretty uniform color scheme (black or red. Take your pick), the Mustafarian is really nicely-colored. its skin is dark, muddy green, and most of its clothing is dull gold. The gold effect looks really good in person, but doesn't photograph too well. The skin is a nice, dull contrast to the faded and weathered gold tones. One thing that's odd is that the same tone is used for the Mustafarian's shirt and the stripes on its skirt as for its skin, which can be kind of confusing - I would have appreciated a little variety, like maybe somewhat of a bluish tint to the stripes. Aside from that little comment, the Mustafarian's color scheme really helps to set it apart from other figures in the line. Hasbro has shown some odd inconsistencies with the articulation in this toy line. Clone Commander Bacara has immobile knees and a permanently-bent arm, Aayla Secura has the folded-arm thing going on, Grievous' bodyguards can't move their knees, etc. 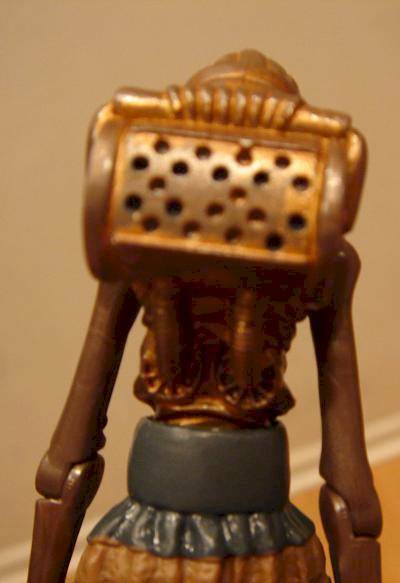 The Mustafarian has a ball-jointed (removable) head, which is only mildly set back by the tubes going into its neck - those are removable, too. It has ball-jointed shoulders, swivel elbows, a swivel waist, swivel hips, and ball-jointed ankles. At first, I was surprised that the knees weren't articulated - it LOOKS like there are articulation points there, and it would have been easy to put them in. But then I noticed how tall and skinny the figure is, and realized what would happen if knee joints came loose. So, you know what? I'm okay with the lack of bendable knees. One thing that does bother me is that its wrists are not articulated, which makes it slightly more awkward to try to hold the included weapon. This can be gotten around, but it's a little bit of a hassle. The elbows can be bent backwards without trouble, which means that you can pretend your Mustafarians are double-jointed if you wish. Overall, the figure has good articulation, but is still missing just a little bit. I am glad to report that it stands well, though, despite how the figure looks. It doesn't fall over. The rule so far for ROTS figures has been simple: If it's a Collection 2 figure, it comes with a base. if it's collection 1, there is no base but there is an action feature or other similar gimmick (The Clone Commander managed to get away with "mission gear"). The Mustafar Sentry is a Collection 1 figure that comes with a base. And not only this, but the base that is included with it is brand new! Gadzooks, what is the world coming to? 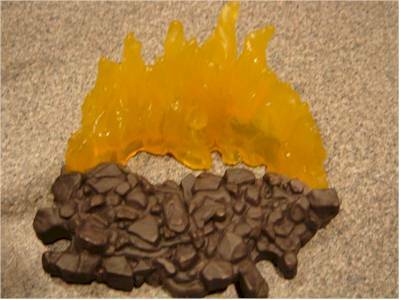 Previous Mustafar bases consisted of a little dried lava and a patch of metal - and have been repainted into mud, by the way. This base features craggy rock with a massive flare of lava in the back. The base is dynamic, excellent, and perfect for displays. 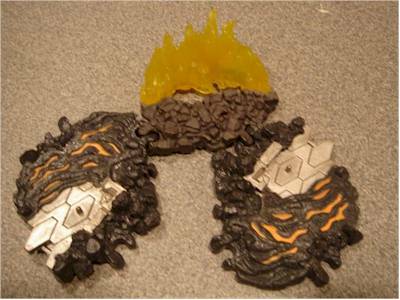 The base also interlocks perfectly with the other Mustafar bases, which looks pretty cool. I would love to see a lot of these bases lined up, forming a wall of fire behind the toys. The other accessory supplies the "action feature" for the toy. 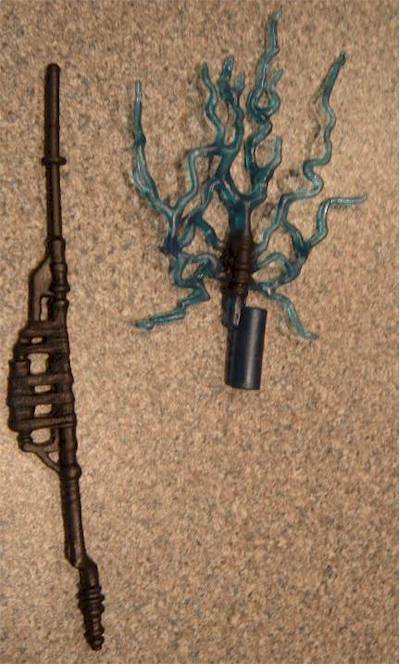 The packaging says, "With spinning energy bolt!," which obviously refers to the included electrostaff that comes with the figure. The instructions tell you to turn the electro-effect for the "spinning action." I am here to tell you that this is a lie from the pit. Sure, the electricity rotates, but it is in no way loose enough to spin - it pretty much stays where it's positioned. This is a good thing, since the lack of a mechanism keeps the weapon from being changed in any way (i.e., made thicker to include a spinning mechanism). The electro-effect can be removed, although this takes off a piece of the staff with it. It's slightly awkward to get the figure to hold his staff right (thanks to the lack of wrist articulation), but it's still a pretty good accessory. It's a cool-looking toy with good articulation, nice durability, and play value. The lack of mobile wrists is slightly irritating, but it's no biggie. This is really a fun toy, and it doesn't seem like a bone tossed to the "collectors" like so many obscure aliens sometimes seem. Depending on where you are, these figures run from $4.99 (good) to $6.99 (bad). Where you shop is your choice, of course. Nothing really, unless you're afraid of the Mustafarian's spindly limbs breaking. I haven't seen enough on the pegs (One) to judge paint apps very much. 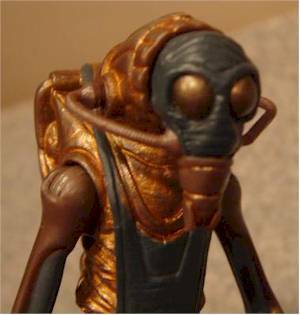 With the exception of the wrists, this is an extremely excellent figure - ESPECIALLY for a minor, no-screen-time alien. I'm impressed with Hasbro right now, and I hope that this is the start of a beautiful new trend. The more figures we see like this, the better! Figure from the collection of Ridureyu.